Sam's Tasty Art: Vancouver workshop! I've been so busy with projects recently that I keep forgetting to post this. 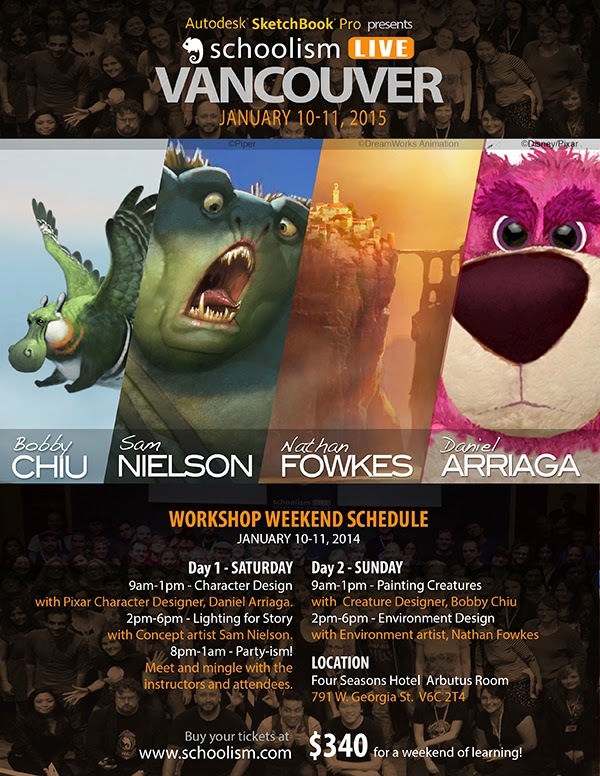 I'll be teaching a workshop along with some legendary artists, in Vancouver in January. I'll be melding some of the stuff from my Schoolism classes together and adding some new things I've been learning into a workshop on how light can be used to tell story. Of course my demo will be painting, but the ideas will apply to any discipline that fuses value, color, and composition. I can promise that the other artists will make it worth coming, and I'll do my best to add something useful to the mix. My guess is that tickets will sell fast, so don't wait too long to sign up if you plan on coming. Thanks Josh, I'll let them know! I was wondering if you ever did any art work around Laramie Wyoming in the 1960s? Sorry, I wasn't alive in the 1960s and I've never been to Laramie.